Our country is now in a verge of fast internet technology, and people are so eager to try the fastest connection Globe has to offer. Since the introduction of LTE in the Philippines, and nationwide upgrade to accommodate huge audience, or rather customer. 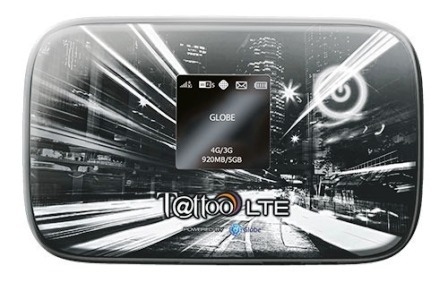 Globe has unleashed its 4G/LTE Pocket WiFi modem, available at postpaid subscription. The WiFi Modem can support both 3G/4G signals, which may come in handy sometimes, and of course the WiFi capability of the modem, which enables you to share your internet connection anywhere. Tattoo Pocket WiFi Maximum Speed? Plan 299 - Enjoy 30 to 50 hours of internet connection. Plan 499 - 50 to 85 hours of internet connection. LTE Plan 1299 - 5gb bandwidth for 1 month. Optional - Additional bandwidth for LTE Plan 1299, Php500 for additional 5gb, and Php1,200 for additional 10gb. The WiFi modem can support up to 10 users. LTE Postpaid plans are unlimited until Dec. 31, 2013.